Reconfiguring the toilet and putting in the pocket door was by far the best thing we did to this little bathroom. All of the walls had to me moved a bit to accommodate for laundry on one side, pantry on the other, closet on back wall and a nice wide mudroom. Even though the square footage is just about the same as before, installing the pocket door, relocating the toilet to fit in the little 'nook' area that was created, as well as finding the narrow vanity I had repurposed, makes it feel much larger. The tile we used ran from the mudroom into the half bathroom. Doing a wall mounted faucet was a last minute decision. 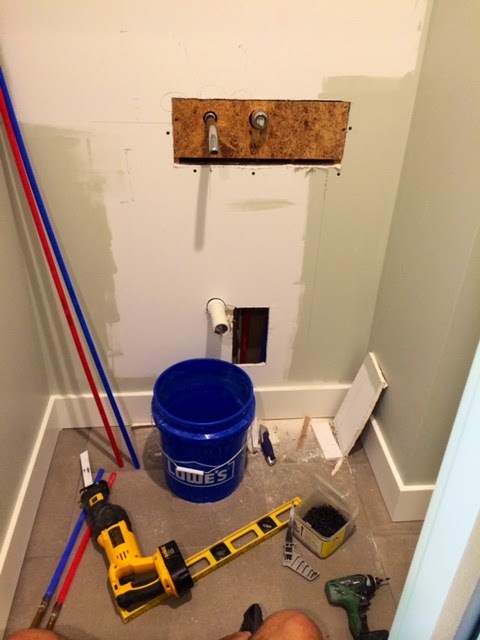 I am grateful that Marc expects nothing less from me than to completely change plumbing details last minute, so he as was able to make it happen. The herringbone tile came in sheets but still tricky with the 8 million little cuts that had to be made along the top and side. Although I ran it all the way down to the baseboard on each side, about 8 inches in, I still used a starting board for my straight, level line. I then filled in the bottom sides afterwards. 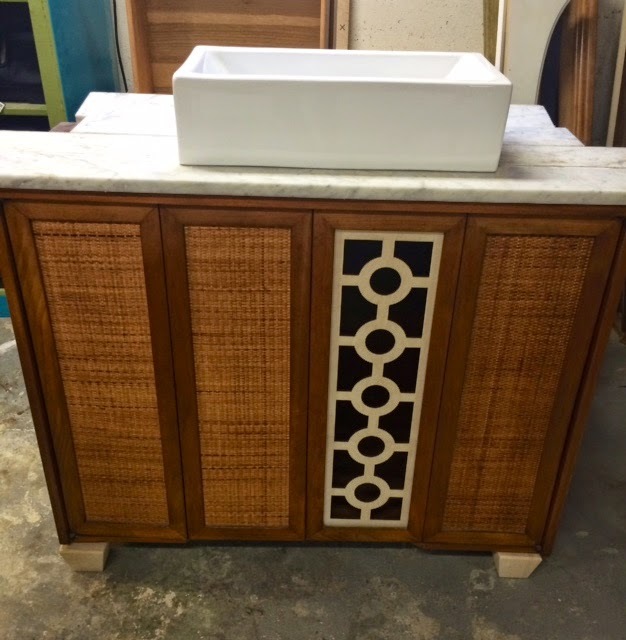 The vanity…can you believe I almost threw out this hutch top?! Having a dumpster in your driveway for the summer makes you pitch crap you've had laying around FOREVER. It's really not a bad thing but I might have tossed a thing or two I wish I kept. Neighbors really like dumpsters too. I purchased this piece to use in my kids hang out room and converted it into their tv console, but never planned on using the top. One day, while walking around my shop looking at my inventory for a potential piece, this caught my eye. The depth and length were PERFECT….but at that point, that was about it. I knew I could remove the dirty wicker inserts and replace with something else but still, it was ugly. I wanted to do some sort of overlay for the inserts and sketched out a design on the wicker. After perfecting the dimensions, I took a picture and emailed this (very professional:)) sketch below, on a piece of baseboard, to Advanced Laser Cutting. They are a local company here in Grand Rapids and very nice people to work with. They had the fretwork design done for me in a few short days. I also started playing around with different feet options. I have used these many times before and they were a great fit for this guy bringing it up to the right height if I used a top mount sink. The countertop was made from the marble window sills that were throughout the house. I had held onto them for years and used in my master bath reno project a few years ago. They would work perfect for this budget DIY project too! They were all the same thickness but varied a little in width, so I cut them all down evenly and then cut to length. 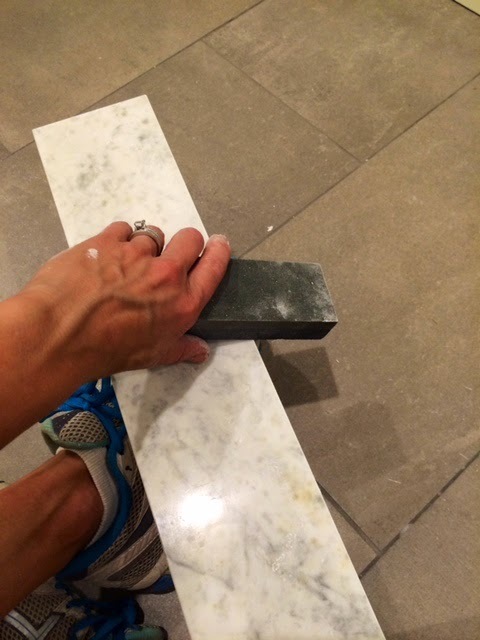 I always use this honing stone to soften up the CUT edges of natural stone. I found this stone at the Tile Shop but have purchased them them from Lowes and Homey D as well. It does a nice job of cleaning up the edges. Instead of mortar I decided to use construction adhesive to glue the marble to the top, leaving very thin spaces for grout lines. 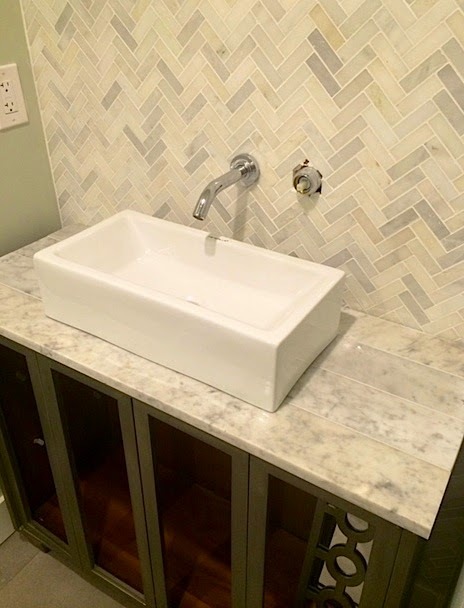 I typically would never used such a light grout on a countertop (or floor) because my motto is "go as dark as you can stand with grout and carpet" but the gray lines contrasted too much, so I used the same antique white as I did on the wall, but sealed it well. Because this was the TOP of a piece, the 'hidden hardware" which is the place where you would normally grab to open is now at the bottom, so had to add some cute little hardware. Love my little Cedar and Moss sconce. Because I had a hard time drilling a hole in this tile, I waited a few weeks to find the mirror I really wanted, which I found at World Market. Even though I am blessed to be busy with custom pieces, I had really been wanting to do a piece just for "fun" for a few weeks now. I seem to always pick the "ugly duckling" piece that has been sitting in my inventory and has been overlooked for a long time. To be honest, I can't believe this beauty was still here. Despite the missing trim and fact that it needed some love, it was really a cool looking piece. After I prepping and spraying the piece in BM-Chelsey Gray, I used Antique Gold Rub N Buff on the areas that I wanted to highlight. Afterwards, I glazed the entire piece but the gold wasn't popping as much as I had wanted it too just a bit too dull. I added Martha Stewart Gold Metallic paint over top of the glazed Rub N Buff. Because this product is fairly translucent (meaning it would take many coats to get a nice, full coverage) one coat gave me exactly the look I wanted. This photo below is BEFORE I used the MS Metallic gold. In this photo below you can see the gold is a bit brighter. This is AFTER I did a coat of the MS gold. I then added a few clear coats of lacquer to seal it all. I love how this buffet turned out for my client. The top was refinished in General Finishes Burnt Umber. She wanted a red tone but I was afraid to go TOO red with a mahogany stain and new that Burnt Umber would provide a rich, warm red color. The "before". I know, not bad but I knew we could make it better! Not sure why I didn't notice, until I went to clean and then reattach the original hardware that the finish was in rough shape. Typically the hardware on these older pieces are in decent condition and just need to be cleaned but with this set, the original finish had chipped off. Even though the chipping was on the dangle part of the hardware, I needed to treat all the bits and pieces to keep a consistent finish. Although I like many shades of gold for hardware, I knew my client would not. My next choice would have been an Oil Rubbed Bronze but it would have blended into the black too much. I really wanted to try and get as close as I could to the original finish so decided to spray (after sanding, cleaning and priming) the hardware in Rustoleum Antique brass, which to me, really has more of a copper-like look. After a few coats of the Antique brass had completely dried, I "dusted" them with the Oil Rubbed Bronze lightly, still letting a bit of the brass peak though. I also did a clear coat over top and here are the products I used. They turned out even better than I was hoping and honestly, this is going to be my new "go to" finish for antique pieces…I love it! It's rare that I paint by hand these days. Most of my clients are looking for a more "finished", high end, factory like finish, which I can achieve best with a LOT of prep work, high end products and a professional grade HVLP sprayer. 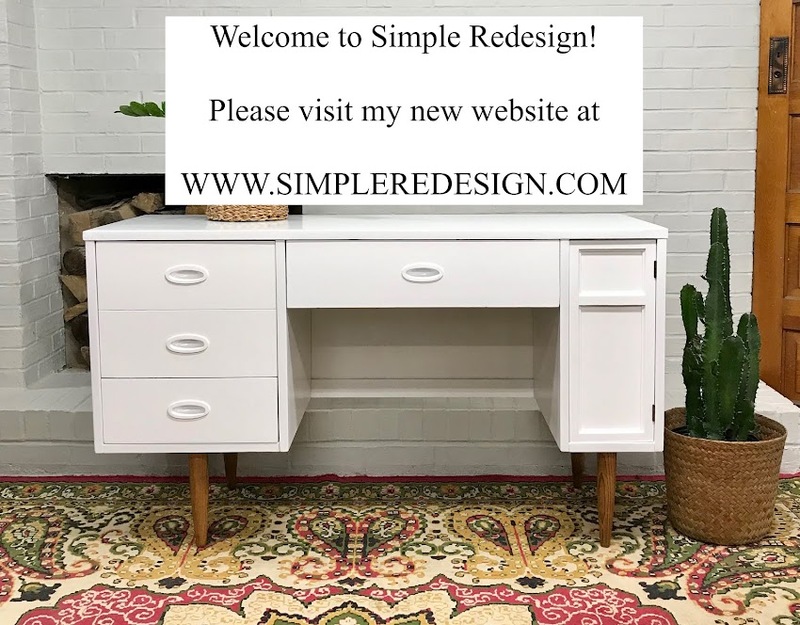 When my client told me she wanted a "chippy", very antique and distressed look, I knew I was going to have to use different products and techniques that I am normally used to. I have used Old Fashioned Milk Paint before but I wasn't crazy about the results. With that particular piece, I didn't sand it at all. This resulted in a VERY chippy look, which I didn't like it and long story short….stripped that piece and went a different route. I decided to sand this buffet. It wasn't super glossy but I was already going against every bone in my body by not removing doors, painting over the hinges and not priming, so I didn't want to push it and give my self a complete anxiety attach by not sanding it also! Plus, even though I know this product has a mind of it's own, I wanted to be able to control the chippiness a little bit. After sanding, vacuuming and giving it a good wipe down. I mixed my product as instructed on the package and started painting. I ended up doing 2 coats, 3 in some areas of the color Barn Red. I wasn't impressed with the flat and dull finish at this point and got a little nervous but knew I would be sealing it, so didn't have a full panic attack. It did flake and chip off in most of the areas you see. I used a putty knife for that but probably because I sanded it, I needed to distress it a little bit by hand as well. Not looking pretty at this point whatsoever! I used my favorite wipe on topcoat... General Finished Arm-R-Seal in the satin finish. It is oil based and the only product that I have found you can successfully wipe on by hand. I use a sock on my hand to wipe on. It dries quickly and is a very hard and durable finish. I did 2 coats on the top. Just for the record...I would never do this (seal by hand) with one of my sprayed pieces but it works beautifully on a hand painted, antiqued piece. My worries about the flat finish quickly disappeared when I saw how nice it looked with the sealer. I did not want this piece to have a lot of shine, but just a nice luster and blend in the rough looking areas from using the putty knife. It also deepened the tone of the wood peaking through.